This two bedroom mid terrace is situated close to the town centre and is in need of some improvement work. 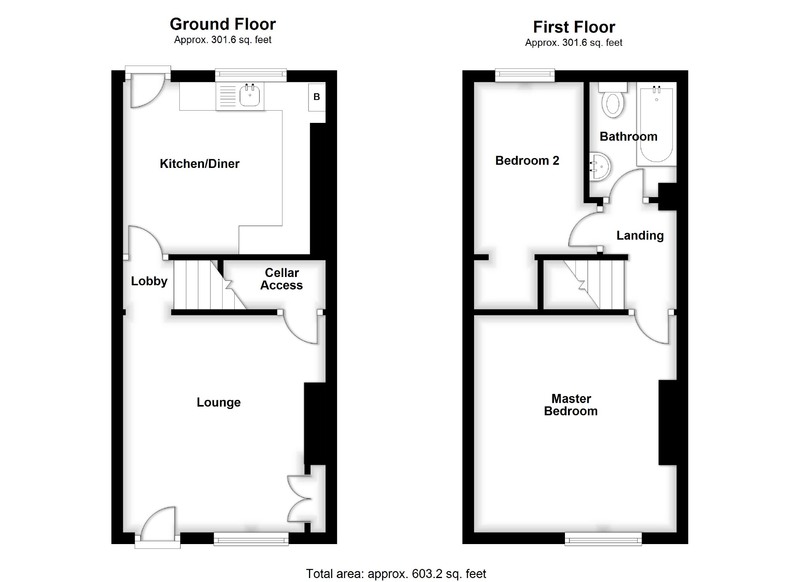 The property is within walking distance of amenities and would offer potential as a buy to let. The property is gas centrally heated with modern boiler and uPVC windows and composite doors. There is a modern kitchen with space for appliances and a modern white finish bathroom is found on the first floor. This property offers preferential on-street parking nearby via residents parking scheme. Epc Rating - An EPC (energy performance certificate) has been carried out on this property with the resulting rating D. To view the full document, go to wwwEPCRegister.com using the postcode to search. Kitchen/Diner - 3.18m x 3.02m min (10'5" x 9'11" min) - Recess with combi boiler, double radiator, fitted base and eye level units with storage and tiled splash-backs, stainless steel sink with drainer and mixer tap, fluorescent strip light, extractor fan, UPVC double glazed window and composite door with double glazed window inset to the property's rear garden. Bathroom - 2.03m x 1.52m (6'8" x 5'0") - Having panelled bath with Triton electric shower over, low flush WC and pedestal wash basin with tiled splash-backs, shaver socket, extractor fan, ceiling light point and central heating radiator. Bedroom One - 3.82m x 3.56m max (12'6" x 11'8" max) - Having radiator, ceiling light point and UPVC double glazed window to the front elevation. Bedroom Two - 3.04m x 1.96m (10'0" x 6'5") - Having radiator, ceiling light point, built-in full height storage closet off and UPVC double glazed window to the rear elevation. Rear Garden - Accessed by way of a shared entry-way to the rear of the site, the garden has a slabbed pathway and small slabbed area to the immediate rear and is otherwise laid to a small grassed space with fencing to the boundaries.